A kind man in his dressing gown helps wildlife rescuer, Wildlife Aid's Simon Cowell, to save an injured fox! 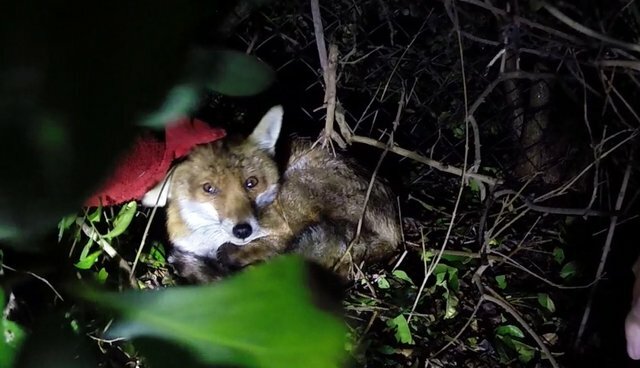 The football fan found the poor fox curled up under a hedge. The fox was very weak, due to a wounded back leg. Leaving the England football game on TV, the gentleman fed the fox with "chopped sausages and cheese" before Simon arrived and brought the animal back the to the wildlife hospital. After two weeks of care, the fox's wounds healed up nicely and he was released back into the newly-proclaimed fox lover/football fan's garden, where he was found.